Great card Sylvie...lovely use of the tag! Super cute...love the black and red combo and that cute snuggly bear! So cute! Love the embossed black background with the red scallop trim! Thanks for joining us this week at Freshly Made Sketches! What a sweet Valentine! So cute! So glad you joined us at FMS! Brilliant use of that tag...It a beauty i might add. Your image is so cute...Great card. Sweet!!! Love your cute little ted with his big heart. Fab card Sylvie. Love the embossed background. Super cute card! Thanks for playing with us at Freshly Made Sketches! 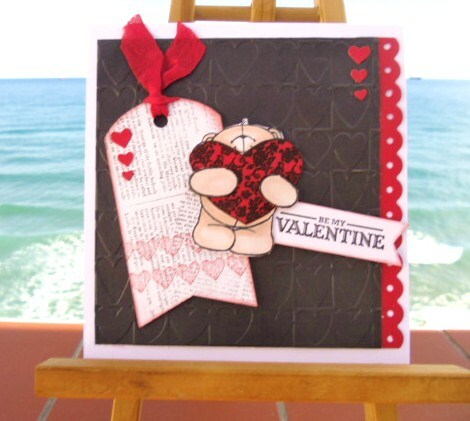 Great job with the sketch and a super-cute Valentine! Thanks for sharing with us at Freshly Made Sketches this week!